xfce4-session process consumes a lot of RAM on my low-RAM machine. I never, ever save sessions. I want to disable this process. But when i kill the process, xfce goes down. And when i try to uninstall xfce4-session in Synaptic, it tells me it's going to uninstall xfce completely. I don't want that. How can i disable this process, and keep xfce running? Session managers do more than just save sessions, namely handling the logout/restart process as well. (Though you can still use the manual methods). Perhaps its telling you that its just going to uninstall the Xfce meta package - which won't really install all of Xfce, just the Meta package. Can you post the message that you are getting? Then restart your computer. This works for me on Arch, but I don't have a Mint system handy to see if it works there. To reset everything, simply rename xfce4-session.BAK back to its original name. consumes 10 to 20 MB. Don't laugh, i'm trying to trim every bit, for 1GB-2GB machines. 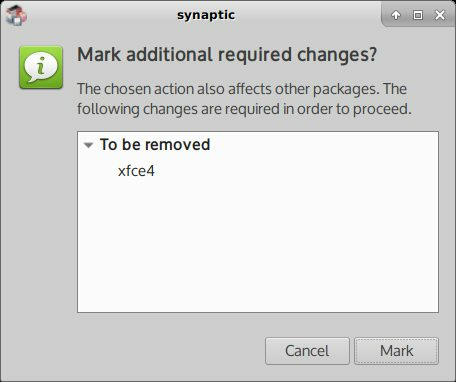 no error-- Synaptic simply reports that it's going to uninstall xfce, when i mark xfce4-session for uninstallation. is xfce4-session needed for command-line login? Xfce is very modular. Although xfce4-session provides a lot of important functionality, it is not required. However, for Xfce to still start properly you need the /etc/xdg/xfce4/xinitrc file that is contained within that package. If you plan to uninstall xfce4-session, copy that file to the ~/.config/xfce4 folder (plus make the change to the xfwm4 command) so that the environment will still start properly. Confirm that its the Xfce meta package that is going to be uninstalled - as opposed to the individual Xfce components. i'm doing this on a custom DebianDog Stretch, not Mint. for Xfce to still start properly you need the /etc/xdg/xfce4/xinitrc file that is contained within that package. If you plan to uninstall xfce4-session, copy that file to the ~/.config/xfce4 folder (plus make the change to the xfwm4 command) so that the environment will still start properly. Update: Wow, it worked! I booted into xfce, no probs. Session is not running. orage now opens on boot, and it keeps running if i close it. How to prevent that? Mint does have one version of its distro that is built on Debian, LMDE3 (Linux Mint Debian Edition 3). But all of the main editions of Mint are built on Ubuntu. Edit the xinitrc file and comment out or remove the line that starts orage. Not sure why its there. Edit the xinitrc file and comment out or remove the line that starts orage. New issue, nothing in ~/Startup/ gets executed now. Suggestions? That is one of the jobs of xfce4-session. As a workaround, try creating ~/.xprofile and adding the applications to autostart there (make the file executable) or add them to the end of the xinitrc file. Thx for thinking outside the box, ToZ! But Startup is a directory, into which i can put script files. So i don't want to call the scripts in .xprofile. Rather, i want a command that says "Execute everything in the Startup directory". i put this into my .xprofile. Is this a good idea? Good syntax? So, .xprofile isn't getting called on boot. Add this to the end of the xinitrc file. your script works if i execute it directly. but not getting executed on boot. also, nothing in Session and Startup app is starting. It doesn't get executed at boot but rather on login. - How are you logging in? Console login or display manager? - Where did you put the script? - Can you post back the full contents of your ~/.config/xfce4/xinitrc file? This is because you disabled xfce4-session. Starting those apps is the job of xfce4-session. How are you logging in? Console login or display manager? the distro i'm using seems to have disabled level 3 boot, and there's no slim or other login manager. It boots right into a root desktop (those crazy puppy linux people). This is not desirable for my scenario, so i don't want to spend time trying to make your script work in this environment. I'll install a 'normal' linux soon, to continue this experiment. Can you post back the full contents of your ~/.config/xfce4/xinitrc file? # over "applications.menu" in all Xfce applications. # or empty, a default equal to $HOME/.config should be used. [ -d "$XDG_CONFIG_HOME" ] || mkdir "$XDG_CONFIG_HOME"
# set or empty, a default equal to $HOME/.cache should be used. [ -d "$XDG_CACHE_HOME" ] || mkdir "$XDG_CACHE_HOME"
test -r "/etc/xdg/xfce4/Xft.xrdb" && XRESOURCES="$XRESOURCES /etc/xdg/xfce4/Xft.xrdb"
test -r $HOME/.Xdefaults && XRESOURCES="$XRESOURCES $HOME/.Xdefaults"
test -r "$BASEDIR/Xcursor.xrdb" && XRESOURCES="$XRESOURCES $BASEDIR/Xcursor.xrdb"
test -r "$HOME/.Xresources" && XRESOURCES="$XRESOURCES $HOME/.Xresources"
echo "You have tried to start Xfce with consolekit support, but"
echo "ck-launch-session is not installed." # in a terminal while Xfce is running. # Use dbus-launch if installed. ok, if possible i'd like to find a way to make that work too. the distro i'm using seems to have disabled level 3 boot, and there's no slim or other login manager. It boots right into a root desktop (those crazy puppy linux people). ...but it is quite old. As the distro's boot procedure might have changed, you should probably create a new thread on that distro's community support forum asking how to do it. Or spend more than the three seconds that I did on glancing at the search results for "puppy linux login manager," lol.